We have more than 100,000 customers, including companies from the following fields: automotive suppliers, OEM, mining and exploration, metalworking, agriculture and forestry, aerospace, power generation, mechanical engineering, construction and transport, as well as the steel, metal and cement industries, yet also companies in the food industry, the glass production sector and the casting and forging industry – and many others. In close contact with its customers, FUCHS develops holistic, innovative and custom-made solutions for the most diverse applications. As a lubricant manufacturer, FUCHS stands for performance and sustainability, for safety and reliability, for efficiency and cost savings. FUCHS stands for a promise: technology that pays back. 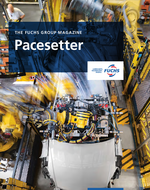 Founded in 1931 as a family business in Mannheim, today there are 58 operating companies with over 5,000 employees in more than 45 countries under the umbrella of FUCHS PETROLUB SE. FUCHS is the world's largest provider among the independent lubricant manufacturers. Ordinary and preference shares in FUCHS PETROLUB SE are officially traded on both the Frankfurt and Stuttgart stock exchanges. The preference share is a member of MDAX. With over 50% of the ordinary shares, the Fuchs family maintains the majority vote.